Naomi Hoopmann graduated from the University of Adelaide with a Bachelor of Oral Health in 2011. She then moved to Melbourne to establish herself as an oral health therapist at Smile Solutions. Naomi is an active member of the Australian Dental & Oral Health Therapists association as well as the Australian Dental Hygiene Association. 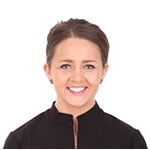 She enthusiastically attends regular meetings and courses to keep up to date with the ever-changing and developing world of dental hygiene and dental therapy, and she has a keen interest in research into oral health. For Naomi, the most fulfilling part of her job comes from providing patients with a valuable health care service while at the same time establishing a trusting relationship. She enjoys being able to work with the patient to help them reach an optimal level of oral health tailored to their own needs and values – all within a trusted and comfortable environment. She is particularly adept at working with children, who benefit greatly from her warm yet informative approach to oral hygiene and disease prevention.